I see Robin Stacey in the credits. More Microlite20 love. The art matches my expectations and deserves its own post. In fact, it probably even exceeds them. During my upcoming business trip, I could spend hours on a plane just examining the illustrations. I recognize a few of them from earlier products. The goblin illustration on page 107 comes directly from the Lost Mine of Phandelver adventure. Yay for “low-level followers” and “hirelings” – torch bearers! This doesn’t contain nearly enough information for me, though. I will need to refer to older DM guides for this sort of thing. Successfully noticing and bypassing a trap should provide XP. I don’t think that the book gives any guidelines for that, or even credence to that idea. I may have missed it, of course, in the brief time since I acquired the book. Reaction rolls on page 244. As a rule, I don’t like to roll for social interaction. But since players “spend” some power to have those skill and ability scores, I can’t just ignore it, either. These guidelines will help a little. HEX RULES!!! I spent many years playing war games, both tabletop and computer-based. 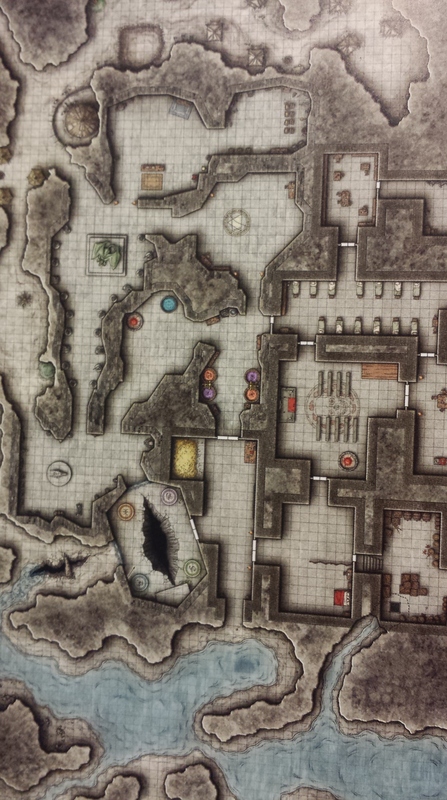 So I have a special love for maps using hexagons and the tactical play they create even if I don’t like using D&D as a tactical game itself. Come to think of it, this may help me get into that mode when it fits. The Madness section on page 258 will assist me greatly with the upcoming “Madness of Iliasha” campaign (spoilers?). 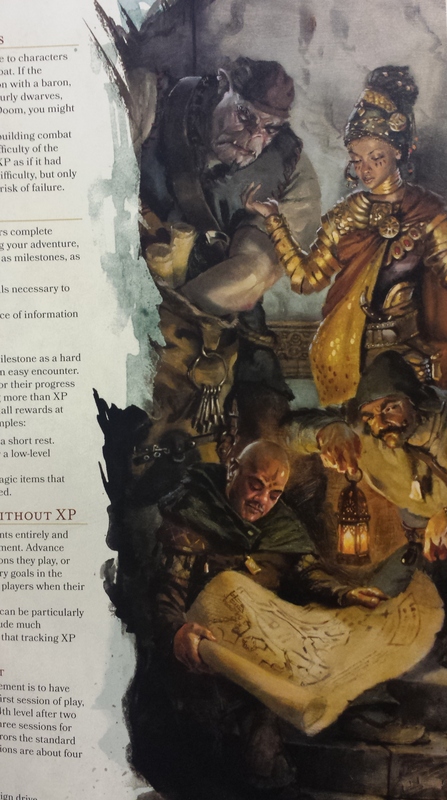 Appendix D: Dungeon Master Inspiration looks like an “Appendix N” with more specificity. The list largely consists of non-fiction books with a few true classics in the greatest possible sense. For example, in addition to lots of books by Gary Gygax and TSR, it includes Le Morte d’Arthur by Sir Thomas Malory. Since the Monster Manual came out, I have wanted to roll up my own monsters. Other DMs have already started, of course, but they have far more experience at it than I do. The section “Creating a Monster” in Chapter 9 starts on page 273. It discusses reskinning, including minor changes such as adding special traits or switching weapons. The section also includes a table on Monster Statistics by Challenge Rating. For each rating, the table lists the proficiency bonus, armor class, hit point range, attack bonus, damage per round range, and save DC. This table fits those situations where you just need something quick, such as an on-the-fly conversion. Part of the D&D experience is the simple joy of creating new monsters and customizing existing ones, if for no other reason than to surprise and delight your players with something they’ve never faced before. This zooms in on the abbreviated process described before. It discusses things like damage and special traits in far more detail. We also have a Monster Features table that covers two full pages. Finally the section discusses the mechanics of creating NPCs from scratch (not the preview section on mannerisms and backgrounds and such). Players get excited to see the actual magic items themselves. People like me get excited to see how we can distribute them. Chapter 7 (“Treasure”) should satisfy us both. The distribution frequency for magic items in this edition in particular has confounded me a little. Page 135 shows a “Magic Item Rarity” table showing the expected character levels per rarity type. For example, common and uncommon items correspond to all characters starting at first level. But rare items typically go to characters at fifth level and higher. Of course the text makes clear that DMs should do as they wish according to what fits their campaigns. The book only makes suggestions, not rules. For more specificity, of course, the book has several treasure tables. It has four different Individual Treasure tables for different CR ranges. The same applies to the Treasure Hoard tables. Gemstones and Art Objects have several different tables by value. Some of these tables refer to Random Magic Items of various types. You can enhance those with tables on magic item flavor (e.g. What Is a Detail From Its History?). Between this and Appendix A on “random dungeons”, I should have no trouble populating environments generated by Donjon or using maps created by other people. Time to go tweak tomorrow’s adventure!